i actually have the 15th for the short cycle top. but, i am deferring to the long cycle here. not my usual mo. yes, i see the h&s pattern developing on gold. but until 1716 is taken out i will remain long here. 1793 is resitance. watching this area closely. raised 10% cash, last time we were here, gold had a correction. so i lightened up 10%. we need a couple of closes over 1793 to bring the 1900s into focus. dharma I think they are waking up but not so sure they are involved in the metals as of yet. At least they haven't told me. I gave up on preaching a few years back and at this point I would rather no one that I do not want to know does know. I guess the world was excited to see gold at 1900, but then took profit down to 1830. First leg pullback? Despite my admonition to post only when bullish, I submit the following for your consideration. After all, men (and women) of honor may honestly disagree. Some folks say that the miners will catch up to the price of bullion. If so, go long the miners and short the metal for a Dennis Gartman type of hedged trade. Or simply hold GG long and sell call optios 10-12 weeks out when Stochastic is above 80 and close them out when Stochastic is below 20. I disagree. I'm short the miners. Period. 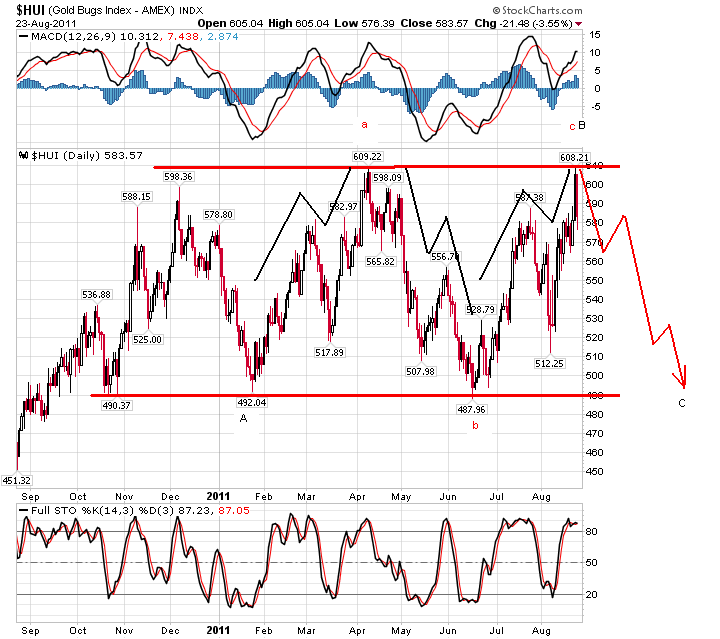 I don't subscribe to a "triple top" theory. I'll let you know when I cover. But it's been a nice ride. i went to 20%cash on tuesday. and i am just watching here. it could be that the top is in but maybe not. i have turns friday/monday. Some folks say that the miners will catch up to the price of bullion. Just when I had that idea Bearvest sunk my enthusiasm. what tools does the fed have @its disposal? and print money. well gold heard him and so did the broads. did some buying this am on the announcement. why should we expect anything else from the bernake. September is here. The weather outside can be frightful at times.